Description Troyon is best known for his animal paintings but, in fact, specialized in landscape painting in his early career. This picturesque view shows a scene on the banks of the Touques River in Normandy where he painted regularly in the 1850s together with Eugène Boudin and Emile van Marcke. The sun is directly overhead, fringing the clouds, shimmering on the water, and illuminating the backs of the cows. Troyon's mastery of light was admired by the young Claude Monet. 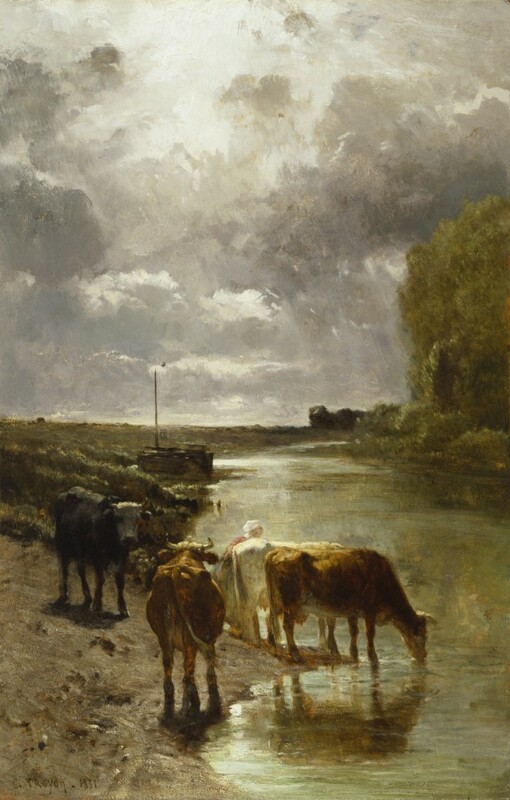 So highly regarded was this river scene that it was included in an exhibition held in 1883 in the galleries of Georges Petit, Paris, to celebrate the world's alleged "One Hundred Masterpieces." Cent chefs d'oeuvres des collections parisiennes. Galerie Georges Petit, Paris. 1883. Provenance Suermondt (date and mode of acquisition unknown); Suermondt Collection Sale, February 1877; Narischkine (date and mode of acquisition unknown); Narischkine Collection Sale, 1883, no. 82; Gustave Viot (date and mode of acquisition unknown); Gustave Viot Collection Sale, Paris, May 25, 1886, no. 9; purchased by William T. Walters (through George A. Lucas as agent), Baltimore, November 25, 1886 ; inherited by Henry Walters, Baltimore, 1894; by bequest to Walters Art Museum, 1931. The Diary of George A. Lucas, p. 640. Inscriptions [Signature] In black at bottom left: C. Troyon. ; [Date] In black at bottom left: 1851.